A simple necklace for simple tastes, this one features a single dog tag in a standard size; it's perfect for customizing with text, such as the name of the person who will be receiving this, their personal info, or anything else they might want people to know about them. It hangs on a 22 inch chain and is made out of tungsten, a very popular metal for jewelry because of how durable it is. The entire thing is polished heavily until it shines, making this ultra-simplistic design something great to look at even without any extras added to it like an intricate design or some kind of stone or stones set into it. Tungsten the hardest of all medals is the metal of choice for this high polished dog tag pendant. Pendant measures 41mm (1 5/8") x 23mm (7/8") not including bail and comes with a 22 inch stainless steel ball chain. 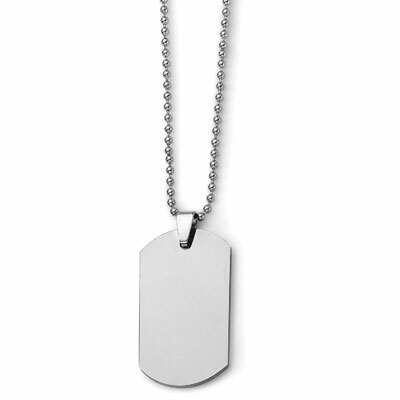 We guarantee our Polished Tungsten Dog Tag Necklace to be high quality, authentic jewelry, as described above.